These two points, he insisted, were the key to understanding the Mass. Given the influence he exerted over the creation of the Novus Ordo, the definition of the Mass found in Article 7 of the 1969 General Instruction was a foregone conclusion. 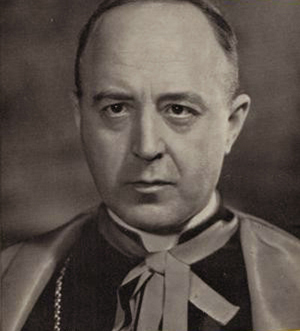 In 1960, when preparations for Vatican II were already under way, Jungmann was given, through the instrumentality of Card. Joseph Wendel of Munich, the opportunity to put his “key” ideas into practice and display them on the world stage. The papal legate Card. Gustavo Testa, 27 Cardinals, 430 Bishops from around the world, approximately 8,000 priests and over a million faithful attended the event. Representatives from other religions were also present, as we shall see later, for “ecumenical” purposes. Fortunately, the background to the Congress was comprehensively documented, and records exist in the holdings of the Archdiocese of Munich, in contemporary newspaper reports (both German and English) and in the published histories of the events. From these we can gain some insight into the thinking that lay behind the organization of the Congress and the role that Jungmann played in making it the revolutionary event that would change the face of Eucharistic Congresses to this day. Before looking more closely into the nature of these changes, we will find it useful to study the archival sources that give detailed accounts of the activities of those who organized the event, their meetings, committee members, letters and notes, their hopes and reminiscences. From this documentation we will see, among other things, an enthusiastic endorsement by the young Fr. Joseph Ratzinger – he would have been 33 years old at the time. In 1959, various committees were established to organize the Congress but, it was revealed, all important decisions were taken by Card. Wendel in consultation with a few key collaborators; these included both Jungmann and Guardini, (4) who played a major role in planning the liturgical part of the event. The main purpose of International Eucharistic Congresses, since their inception in 1881, (5) had always been to glorify the Holy Eucharist and to bear public witness to the Real Presence of Christ in the Blessed Sacrament. That is why they were characterized by displays of pageantry and dignity in which the procession of the Blessed Sacrament, comprising hundreds of thousands of people, was the most conspicuous feature. But all that was about to undergo a radical transformation in 1960 when Jungmann and his colleagues on Card. 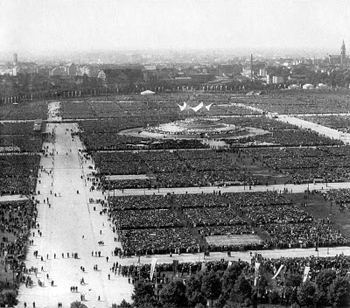 Wendel’s Committee planned the Munich Congress in such a way that the whole emphasis lay not in adoration of the Eucharist, but in the celebration of the community. The Munich Congress was the opportune and decisive moment or kairos when Church authorities succumbed to the utopian fantasy about the “brotherhood of man” and made it the basis of a new, desacralized liturgy that would replace the traditionally God-centred worship. It is hardly a coincidence that the two conspicuous hallmarks of the Congress, namely, “the gathering” and “the Supper” were also the two defining characteristics of the Novus Ordo, according to its General Instruction of 1969. Having been turned down by the Holy See as the site of next World Congress, Mozambique held its own National Eucharistic Congress in 1956. Joseph Wendel, Der Wahrheit und der Liebe (Truth and Love), Würzburg: Arena-Verlag, 1961, p. 63; Peter Pfister, ‘Zwei Hauptfiguren des Eucharistischen Weltkongresses: Erzbischof Joseph Kardinal Wendel und Weihbischof Johannes Neuhäusler’ (The Two Principal Characters in the Eucharistic Congress: Archbishop Joseph Cardinal Wendel and Auxiliary Bishop John Neuhäusler), in Für das Leben der Welt. 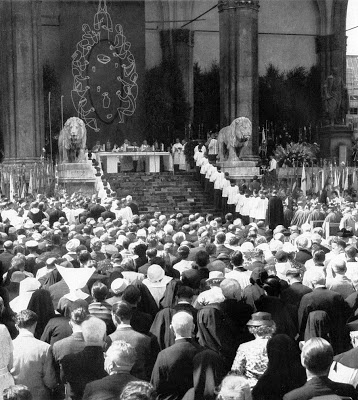 Der Eucharistische Weltkongress 1960 in München (For the Life of the World. The 1960 International Eucharistic Congress in Munich), Schriften des Archivs des Erzbistums München und Freising 14 (Documents of the Archives of the Archdiocese of Munich and Freising), Regensburg, 2010, p. 47. The others were the Auxiliary Bishop of Munich, Johannes Neuhäusler, Franz von Tattenbach, S.J., and the German theologian, Fr. Richard Egenter. See Peter Pfister, Gemeinschaft erleben – Eucharistie feiern Der Eucharistische Weltkongress 1960 in München, (Experience Community. Celebrate the Eucharist. 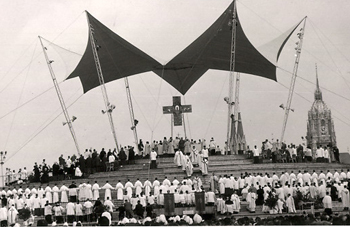 The International Eucharistic Congress in Munich 1960), Archives of the Archdiocese of Munich and Freising, p. 15. The First Eucharistic Congress was instituted in 1881 in Lille France, by a lay woman, Emilie Tamisier (1834-1910). Since her childhood, she had a life-long devotion to the Holy Eucharist and had organized pilgrimages to the places where Eucharistic miracles had taken place. Her work was supported by St. Pierre Julian Eymard, the founder of the Blessed Sacrament Fathers and Brothers, and approved by Pope Leo XIII. At the International Eucharistic Congress in Dublin in 1932, for example, where about a million people attended the closing Mass, only one person partook of the Sacrament, namely, the celebrant, the Papal Legate Card.Lorenzo Lauri. “Nicht die Eucharistie selbst ist das Ziel der göttlichen Heilsveranstaltungen, sondern das Gottes volk.” . Kongressdokumentation Statio Orbis, 1961, (Congress Records) J. A. Jungmann, Statio Orbis Catholici - Heute und Morgen (The Gathering-place for the World’s Catholics – Today and Tomorrow), in R. Egenter, O. Pimer, H. Hofbauer (Eds. ), Statio Orbis. Eucharistischer Weltkongreß 1960 in München, 2 vols., Munich, 1962, vol. 1, p. 81. A large fairground historically associated with the wedding of Prince Ludwig I of Bavaria and Princess Therese of Sachsen-Hildburghausen which took place there in 1810. It is the site of the annual Oktoberfest, the world’s biggest beer-drinking festival. Michael Derrick, “The Eucharistic Congress at Munich,” The Tablet, August, 20, 1960. “Er sah darin eine “Sternstunde” seiner Erzdiözese, einen gnadenhaften Anruf Gottes, mit seiner Erzdiözese der Welt einen einmaligen Dienst zu tun. Was in jahrzehntelanger geduldiger und gediegener liturgischer Erneuerungsarbeit von Katholiken deutscher Zunge geleistet worden war”. Apud R. Egenter, “Der Kardinal und der 37. Eucharistische Weltkongress” (The Cardinal and the 37th International Eucharistic Congress), Josef Kardinal Wendel, Der Wahrheit und der Liebe (Truth and Love), Würzburg: Arena-Verlag, 1961, p. 64. In 1923 it was the site of the brief battle that ended Hitler’s so-called “Beer Hall Putsch,” his failed attempt to take over Munich as a preliminary to overthrowing the Weimar Republic. They saw it as proof that “active and intelligent participation of the faithful” in the Mass was better than “processions and devotional exercises” and as “a convincing example of that universal fraternal charity that must be the necessary fruit of Mass and Communion.” See Augustine Cornides, “The German Scene,” Worship, vol. 35 n. IV 1960-1961, p. 257. Piero Marini, The Shape, Significance and Ecclesial Impact of Eucharistic Congresses, June 9, 2009. Sacred Congregation of Rites, Instruction on the Worship of the Eucharistic Mystery, 1967, § 18. However, the concern for a supposed unity in communal activity overlooked the fact that the authentic supernatural community of the Church can only be achieved through the union of each individual soul with Christ; and a precondition for that union is prayer and contemplation in an atmosphere of mystery, holiness and reverence. The Catholic Academy of Bavaria, Der Eucharistische Weltkongress in MünchenErinnerung, Reflexion, Auftrag (The International Congress in Munich 50 Years Ago, Reminiscence, Reflection, Mission), July 20, 2012.